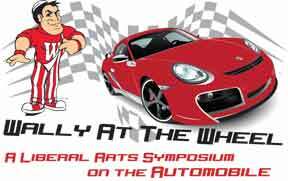 Alumni, faculty, and staff of Wabash College will take an in-depth look at the evolution of the automobile in Wally at the Wheel: A Liberal Arts Symposium on the Automobile on Friday, February 24. This marks the third straight year that alumni are partnering with faculty and staff to present a day of colloquies followed by a festive dinner. The topic of this year’s symposium, the automobile, will be covered from every turn on the track. Faculty will present talks on the physics of car crashes to the economic impact of the federal government’s bailout of the auto industry. Alumni are taking part, too, with talks on the environmental impact of cars and the convenience they provide and what it’s like to compete in demolition derbies. All of the colloquium talks will take place in Hays Hall beginning at 1:00 p.m. Friday. All are free and open to the public. One of the highlights of this year’s symposium is the Wally at the Wheel Car Show in Knowling Fieldhouse. Jim Davlin ’85, who recently took the wheel as treasurer of General Motors, will give the after dinner keynote speech. He’s also bringing a couple of GM’s finest cars — a 1955 Bel Air Convertible and a 2012 Camaro ZL1 with a supercharged 6.2-liter V-8 that cranks out 580 horsepower. Other cars in the show range from a 1947 Willy’s jeep to a 1965 Corvair Monza to a 1971 Dodge Challenger. Ray Knight ’69 will display a 1951 Porsche Sauter Roadster — the only one of its kind ever built — and he will tell the remarkable story of the car and its restoration. RSVPs are required for the reception, car show, and dinner. Cost for the dinner is $25 per person. For more information or to sign up, contact Heather Bazzani in the Alumni Office (bazzanih@wabash.edu or 765-361-6360). A schedule of the presentations follows, as well as a tentative list of the cars that will be exhibited in the Wally at the Wheel Car Show. 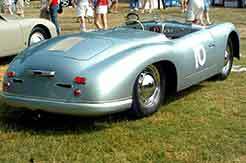 Ray Knight used the breadth of his liberal arts education when he started the restoration of a one-of-a-kind car, the 1951 Porsche Sauter Roadster. Not only did he face a nearly impossible task on the restoration front, there was almost no history recorded of the racecar built at about the same time as Porsche’s 1951 series of America Roadsters. With rear-hinged “suicide doors” and a nifty 1500-cc engine that cranked out 52 horsepower, the Sauter could do 185 kph. Over time, Knight discovered the car’s unique history (published in Porsche Panorama in February, 1987), and he did the impossible: he rebuilt the car from scratch — devoting some 3,800 hours to the project. The car raced in Europe for a year in 1952, another two years in America (after undergoing some design changes), and was retired in 1954. When Knight found the car, it had a blown engine, been in a barn fire, and sat outside in the weather from 1958 until Knight rescued it in 1982. Enjoy Ray’s account of rebuilding one of the most mysterious cars ever built. Michael Bricker is a designer, filmmaker, and social entrepreneur, working in both Indianapolis and Austin. Most recently, he has worked as the production designer for feature films Computer Chess and Natural Selection (winner of SXSW Grant Jury Prize). In addition to his film work, he serves as the Chief Innovator for People for Urban Progress, an Indianapolis-based innovation center and do-tank. PUP is known for the salvage and repurposing of both the RCA/Hoosier Dome roof fabric and the arena seats from Bush Stadium. Michael earned his Masters in Architecture from the University of Texas at Austin. He currently also serves as a Visiting Assistant Professor of Art at Wabash College. Ryan Daming was a political science and music double major and is a class agent. He graduated from Indiana University School of Law Indianapolis in 2006. He is the Chief Operating Officer of Daming Excavating, a company that works on new homes in the Indianapolis metro area. He has restored two classic cars and has competed in approximately 30 demolition derbies, including events in the RCA Dome and Lucas Oil Stadium. His dedicated cheering section includes his wife, Jamie, and three daughters, Grace, Madeline, and Lily. The 1950s, '60s, and '70s bore witness to extraordinary changes in American society. Among the prime causes of these changes were our twin love affairs with American muscle cars and their music machines. In this presentation, we take a closer look at the changing landscape of the "popular portable music" industry: the songs, the sentiments, and the technology. Richard Bowen grew up in a small town in south-central Pennsylvania. At the tender age of 19, he was smitten by his first four-wheeled love, a sky-blue 1962 Sunbeam Alpine. She was, however, a high-maintenance consort, who required regular confirmations of his devotion. The final straw was the new engine, which not only cooled the relationship but "broke the bank." Fortunately, Richard recovered from this misfortune and cultivated subsequent automotive relationships, including: a 1950 Chevy (which drank a quart of oil every 20 miles); a 1969 Fiat 850; a 1961 Borgward; and a 1940 Cadillac 60S. Richard teaches in the Wabash Music Department and directs the Glee Club. We have been crashing cars since their invention over 100 years ago. Incredibly, it took us almost 80 years to finally apply physics principles to automotive safety. I will introduce the key ideas from physics that have dramatically reduced the number of fatalities in car crashes both on the road and the racetrack. Finally, I will talk about your best strategies to avoid a crash and reduce the likelihood of severe injury in the event of a crash. According to the World Health Organization, road traffic injuries were the ninth leading cause of death worldwide in 2004, and are projected to rise to the fifth leading cause of death by the year 2030. How can we make driving less dangerous? Traditional methods involve restraining risky behavior via traffic signals, warnings, and enforcement. The psychological discipline of human factors, however, emphasizes not simply external rules but control from within: design elements, grounded in a scientific understanding of the mind, that naturally evoke proper action. Through a look at the work of Dutch traffic engineer Hans Monderman, I will examine the potential for increasing traffic safety by designing roads that appeal to the processes of human cognition and social interaction. Spend a few minutes watching television or flipping through a magazine, and you're likely to see an auto advertisement. In a 30-second commercial or a single image, advertisers communicate volumes about their product through selectively chosen words and images. In this interactive presentation, we will identify several of the persuasive tools they frequently use. From the founding days of the influential musical genre, rap music, the importance and celebration of the automobile has become a multi-faceted symbol within the hip-hop culture and the urban community. The passion for the automobile in rap music and hip-hop culture spawned not only a new descriptive language about cars, but also a new industry driven by the interests and desires of rap artists and their fans. This presentation will examine the historical rise of the automobile in rap music and hip-hop culture and how this relationship has not only influenced and impacted the auto industry, but American society and culture at large. Shawn Miller is an avid car collector who will discuss Indiana's history in the development of the automobile. In the early days of the automobile, Indiana was a literal epi-center of the industry. Miller will walk us through that history and talk about his own passion for cars. In 2008-09 the US economy experienced a severe recession. Sales of automobiles fell, and US automakers faced bankruptcy. Should the government have bailed out GM and Chrysler, or should it have let them fail? This presentation will present both the case for a bailout and the case against bailout, and will evaluate the path chosen by the government.